(11:20 a.m. EDT) -- Europe is one of those destinations where, if you're cruising, you want to arrive a couple days early to give yourself extra time to soak up the culture. For those thinking about a Disney Europe cruise, you can add a pre- or post-sailing tour with the company's land operator, Adventures by Disney. When you take a pre- or post-cruise tour, all the work is done for you (hotel, tours, meals, etc. ); plus, you have the high quality, fun-filled atmosphere and sense of security that comes with any Disney product. We just returned from a three-night Barcelona adventure and cruise on Disney Magic, which spends its summers in the Mediterranean and Northern Europe. Here are six lessons we learned that might help you decide if an Adventures by Disney pre- or post-cruise tour is for you. 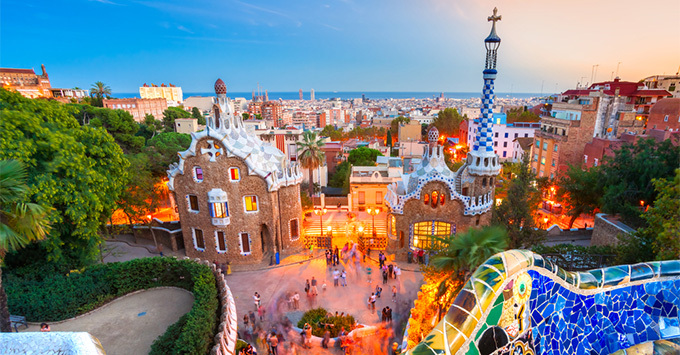 Note: As of now, "Short Escapes" are only offered in Barcelona and Copenhagen -- from where most Disney Magic cruises depart; a longer land tour is available in Rome. The line also offers a selection of Adventures by Disney cruises -- in addition to its popular river cruises -- which features Adventures by Disney tours in every port. 1. You don't have to plan your own trip to have flexibility. Throw away any idea of a rigid, overwhelming schedule. Adventures by Disney factors in free time and flexibility, so travelers have a chance to explore on their own. After two full days of sightseeing and getting our bearings, we were given a night to ourselves, which allowed us to return to one of the neighborhoods we toured earlier that day (the Gothic Quarter) and enjoy a private dinner and a little shopping. Even individual tours allow for time to roam around and take pictures. 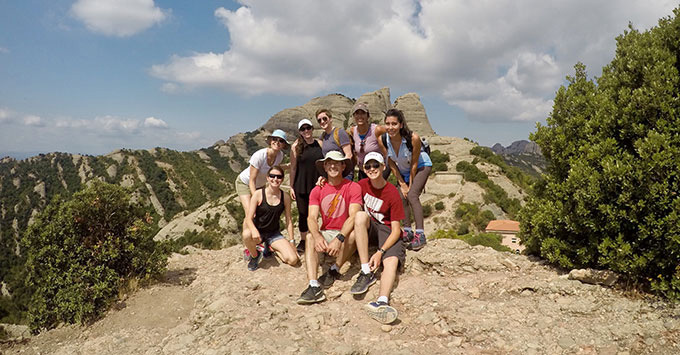 We especially loved that our visit to Montserrat included a little more than an hour for us to hike the surrounding trails, after experiencing the monastery. 2. There's no need to break the ice. The Adventure Guides do it for you. On the first night -- after everyone has arrived and settled into their hotel rooms -- the guides host a welcome session ahead of dinner. Our guides Korey and Marco kicked off the adventure by giving a little background on themselves and a sneak peek of the tours that lay ahead. Afterward, they asked one person (the token extravert) from each group to stand up and introduce themselves and their travel companions, and what brought them on the trip. It was a fun way to get to know everyone we'd be with for the next few days. 3. You'll never go hungry or thirsty. Don't worry about packing water or snacks for the ride; Adventures by Disney's got you covered. For every tour, they stock up on water and assorted snacks, even going as far as to buy separate snacks for anyone with an allergy or dietary restriction. In addition, lunches are included (again, the Adventures team makes sure all special requests are accommodated ahead of time). Just make sure you leave room for dinner. And wine. 4. It'll be hard to go back to a 'regular' tour. Nothing against our shore excursions once we got on the ship, but our Adventures by Disney tours totally spoiled us. A lot of that has to do with the guides. Korey and Marco are far from typical guides leading the "same old, same old" tours. They're down to earth and personable, they genuinely love what they do, and they have fun doing it -- from holding impromptu trivia matches on the bus to taking a more buoyant approach to tours. Their unique style of "guiding" made an impression even among the kids in our group -- some of who made drawings and farewell cards for them before they departed. 5. There's no such thing as too much wine. Especially if the kids are misbehaving. OK, we're kidding. Complimentary local wines are served with just about every meal, so you're bound to have had your fair share by the end of the trip. As long as you know your limits, don't be ashamed to have a second glass (which probably already will be refilled before you even ask). Bonus points if you can get your hands on some cava -- Spanish sparkling wine -- the preferred drink by locals. 6. The adventure doesn't stop when the trip ends. And by adventure, we mean the connections you make during the tour -- regardless of whether you take it before or after your cruise. We preferred the former, as it allowed us and others in our group (including families with kids similar in age) to develop friendships we carried onto our cruise -- and, thanks to social media, after we disembarked the ship. What better cure to vacation blues than being able to relive the memories with new friends? Looking for inspiration? We roundup the best port cities for cruise-and-stay options. For even more Adventures by Disney, check out our review of its chartered European river ship.